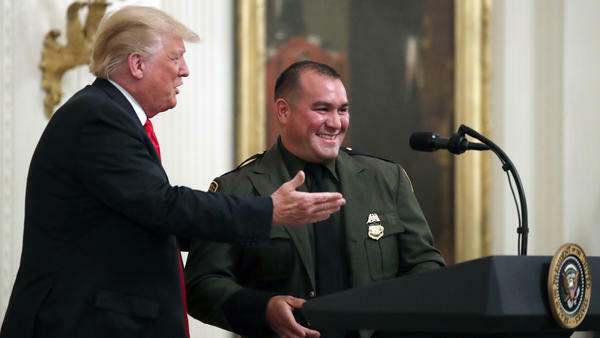 President Trump with Customs and Border Patrol agent Adrian Anzaldua, whom he praised for finding around 80 immigrants in a tractor-trailer and for his "perfect English." Speaking before agents of Immigration and Customs Enforcement as well as Customs and Border Protection officers, Trump lashed out at opponents of ICE and CBP (which Trump repeatedly referred to as CBC) who have blocked access to ICE offices and called for abolition of the agency over the administration's policy of separating migrant children from their parents and strict enforcement of immigration laws. "The vast majority, they're all with you," Trump said, calling opponents a small group that gets a lot of publicity. "They have no courage, they have no guts, just big loudmouths. We don't want to put up with that. ... I just want you to know that you're loved, you're loved, and you're respected." A recent Pew poll found that ICE has become one of the most polarizing federal agencies, with nearly three-quarters of Republicans viewing ICE favorably while the same number of Democrats view it unfavorably. Trump seemed to confirm that split, telling the audience, "The Republicans, we're with you all the way" and that people "respect law and order," hinting he intends to make that an issue in the upcoming midterm elections. He said what he called a "phony blue wave" of Democratic wins would mean "crime and open borders, not good." Trump singled out several ICE and Border Patrol agents during his remarks, including Border Patrol agent Adrian Anzaldua, who was responsible for discovering a tractor-trailer containing nearly 80 immigrants in Laredo, Texas. Trump asked Anzaldua to come up to the stage to recount his actions, saying, "He speaks perfect English."